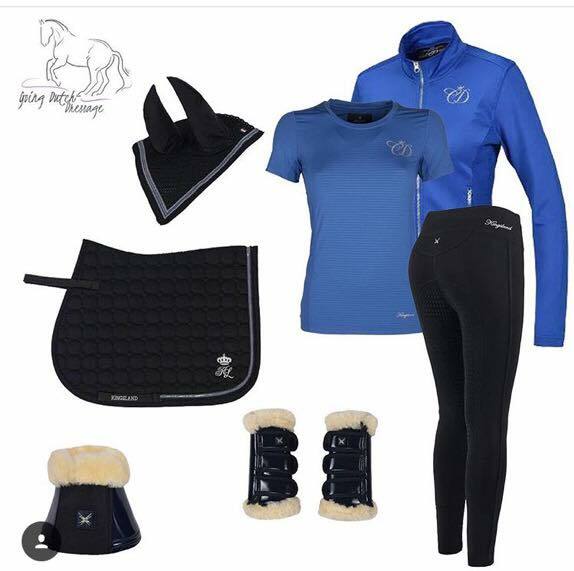 I love Kingsland Equestrian above all other rider-wear, the high end brand can be relied upon to be smart, well fitting and functionally designed with real riders in mind, and in recent years have convincingly proven that Kingsland it isn't just for show jumpers! When I saw Kingsland Equestrian had launched a range of riding tights I put my name down on the wait list at Equissentials Dressage. With numerous designs available I trusted the stylish founders, Hayley and Nic to choose the right line. Deciding to stock the Chisasib Leggings, a riding tight with a full grip seat. This is the exact reason Equissentials Dressage are my go to company, if they don't advocate it, they don't stock it. When the parcel arrived I laughed...they were teeeny tiny, however I know my size in Kingsland and I also trust Equissentials Dressage would have advised if I should have ordered up a size. Thankfully the laughing was replaced by a big smile, they expanded as I comfortably slipped in my leg into the stretchy material. True to Kingsland the fit is incredible, they don't slip down and have a thick, high waistband to ensure a flattering fit. I have ridden in them constantly, they're super grippy making my no stirrup work a breeze, plus they're breathable and quick drying and the sleek, shiny Spandex in the material means dirt and loose horse hair doesn't stick to them. As always my only reservation with Kingsland is the washing instructions because they're never simple. A little scared of my Chisasib Leggings shrinking I wanted to thoroughly test this before writing my review. As per the instructions I washed on a 30 without fabric conditioner and a quick spin afterwards, breathing a huge sigh of relief when they were still a perfect fit! Most of the Kingsland Collections are limited edition and I love this seasons black and blue Charlotte Dujardin range...I would happily swap my whole equestrian wardrobe for this beautiful collage created by fellow equine blogger Going Dutch Dressage for Equissentials Dressage. Nowadays there are a lot of companies that are offering high quality fitness gear at very good prices and if you don't want to spend a fortune on the bigger brands then online shopping is the way to go. I also purchased the Designer Leggings and t-shirts for yoga. The quality is supreme and you cannot tell the difference between these and high end branded ones.